Mysterious MOBI files that you are probably struggling with at the moment refer to Mobipocket eBook file. This is a popular ebook format that is typically used on smartphones, PDAs and Amazon Kindle readers. If you want to read a MOBI ebook on PC, you would need special software to open it. 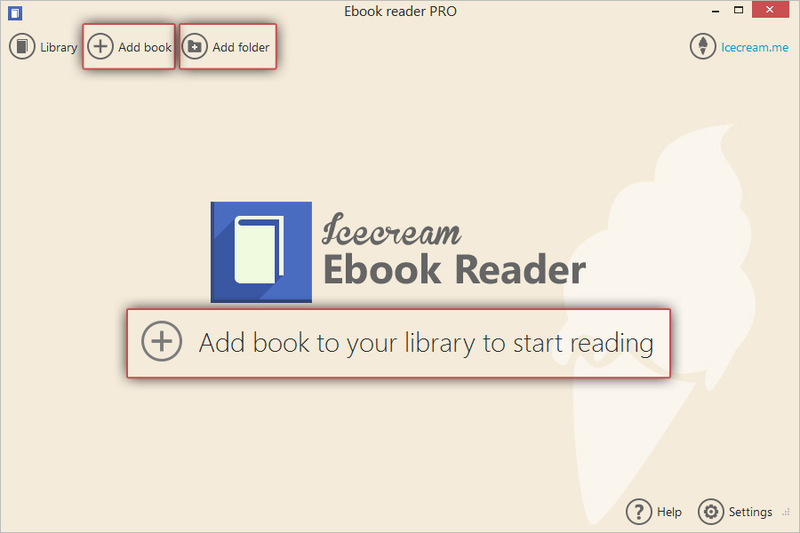 Icecream Ebook Reader is a desktop application that works with several ebook formats, including MOBI. In this article, you can learn how to open MOBI files with Icecream Ebook Reader. To download the program onto your computer, press the corresponding button on this page and save an .exe file on your hard drive. After that, double click it to run the file and start the installation according to the Wizard’s guidelines. The entire process doesn’t take long, and 30 seconds later you can launch the program and work with your MOBI files. Click the “Add book to your library to start reading” button in the center of the main window or "Add book" button on the upper left. Windows Explorer that will be opened right after will help you to choose the MOBI files from your PC. To save your time and add books to the Library by folders simply click the “Add folder” button. Dragging the needed files and folders into the program's window will also do. 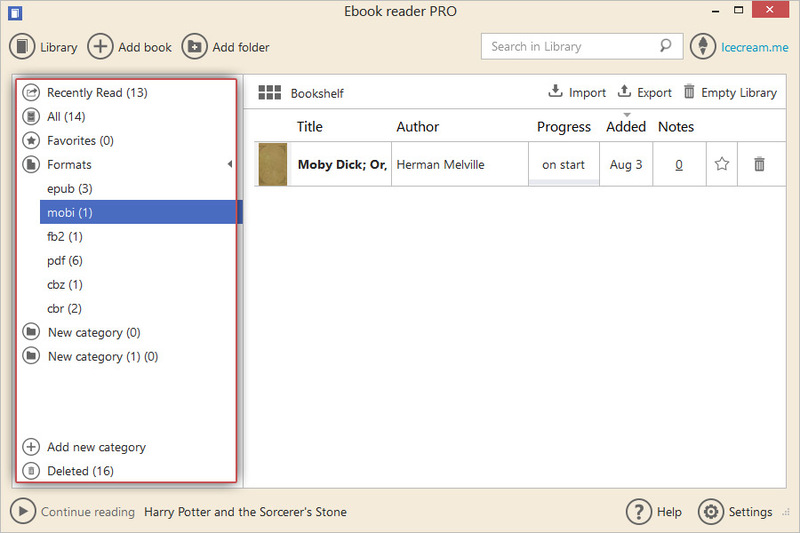 Click the “Library” button in the upper left corner of the main window to access the files added to the mobi reader's Library. All the books can be displayed in the Table View or Bookshelf modes: to switch between them, click the relevant icon in the upper part of the program's working area. When the Library is shown in the Table view, it is being displayed in the table form and you can find such information about the ebooks as their titles, authors, reading progresses in percents, dates of the addition of the files to the Library, the number of the added notes and highlightings to the books. Also there are options to mark a book as Favorite (a star icon in the left hand side of the table) and to delete the book (a recycle bin icon in the most left side of the table). In case the Library is opened in the Bookshelf view, you may see the book covers' thumbnails. There is a menu at the left side of the window – use it to filter the contents by recently read/all books/favorites/formats. As for the formats, you can roll down the list of all the formats supported by the program (epub, mobi, fb2, pdf, cbz and cbr). Click the “mobi” option to see all the mobi files added to the Library. Right under the list of the formats “Add new category” button is located. A single click of this button adds a new user category to the Library. All the newly added categories are located right below the list of the formats. In the bottom of the menu there's a “Deleted” folder to which all the books that you delete from the Library are moved. From this folder you can either restore the books (one by one or all the books from the folder) back to the Library or completely remove them (also one by one or all the books). Click the “Settings” button in the bottom right corner of the window of the MOBI reader. After that, you will be redirected to the Settings panel of the program where you can tweak the configurations needed for the most effortless work with the program. There's more about the offered options that can be set here in How to Change Icecream Ebook Reader Settings article. 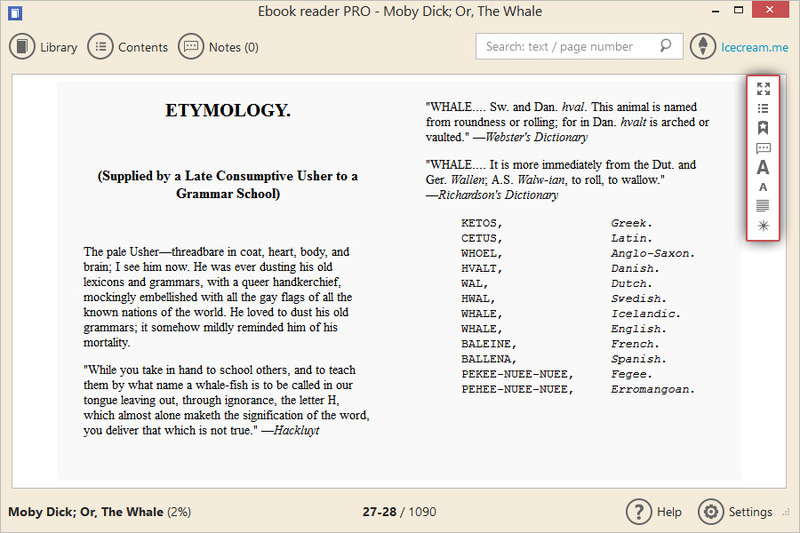 As soon as the book's title or thumbnail (if you're viewing the Library respectively in Table view or Bookshelf modes), it is opened in the reading mode. By clicking at the sides of the book's pages or pressing “Left”/“Right” or “Space”/”Backspace” keys on your keyboard you can turn the pages. To fast scroll through all the pages of a book you can turn to the help of the navigation scrollbar at the bottom of the opened book. The program features a handy toolbar at the right side that will help you read in a more convenient way. For example, you can choose to read in a full screen or window modes (alternatively you can use F11 button to switch between these modes), check the table of contents/list of bookmarks, bookmark the pages, open the notes panel with all the added notes and highlights to a book, change font size (increase or decrease) and page view (switch between single and double page layout), and choose the reading profile (Day, Night or Sepia). Your reading progress is displayed on the bottom of the window.